This is the last segment in the ‘How to improve’ articles. Anything else to learn will come from experience, both fun and match. I feel that this article is as much important as any in the series because it deals with behavior. 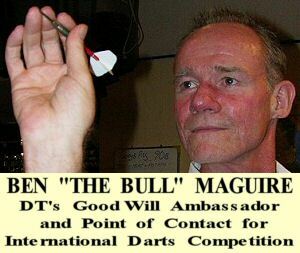 Firstly let’s deal with gamesmanship as I would hope never to witness its presence in any dart game whether fun, serious or in the professional ranks. The art of gamesmanship is the ability to deliberately put off your opponent without infringing the rules of play including etiquette. Without exception ‘Seve Ballesteros’ was the master at intimidation in the game of golf and was revered for his ability to mentally beat his opponents. In darts however it is something that I feel is totally unnecessary and for that reason will not be committing any tips to print. Etiquette on the other hand is a subject matter close to my heart and I like to think that whenever I play, under whatever conditions, etiquette is always present, at least from my part. So, how to exercise etiquette when playing darts. 1. When at the ‘Oche’ throw your darts in your time remembering the 18 seconds. 2. Once your score has been mentally recorded by the chalker (not written down) move away quickly behind the oche and away from your opponent out of his/her vision. 3. If there is any discrepancy in your score wait until it is your turn to throw then approach the chalker. Upset your own rhythm not your opponents. 4. When waiting to throw again refrain from any activity likely to disturb his focus on throwing, after all if you continue to ‘put him off’ you will soon find your own throw interrupted by clicking darts, unnecessary vocal volumes and opponents walking in your eye line. 5. If you must engage in conversation with an outside party, do it out of earshot as much as possible, it will not go unnoticed if you do OR if you don’t. 6. It is courteous to acknowledge good darts, it is not necessary to acknowledge all darts thrown. It soon becomes a diluted gesture and can be taken the wrong way. Chalking requires a level of etiquette just as important as in play, after all the only person in a players line of sight is the chalker. As the chalker you also play the role of unbiased referee, it is your job to record the actual score made, not be informed by the thrower. If he/she is removing the darts before you can record the score then you must correct that situation as nicely as you know how otherwise discrepancies will occur. It is the responsibility of both you and the player recorded to make sure the correct deduction is made to the scoreline. If as chalker you make an error one of the players should notice this and ask for correction. This however should never be done whilst a player is throwing. 1. Refrain from leaning forward to see what each dart has scored. Wait until all three are in the board, the board is then yours to record scores expediently. 2. If you make an error in the score, again wait until the player throwing has completed his throw, then make the necessary correction. 3. Be clear and simple in your scoring, you may be an artist who loves hieroglyphics but from 8 feet away it looks more like dyslexia. 4. Do not engage any third parties while chalking, it’s disrespectful to both players and disturbs your focus on scoring. Be still, pay attention and you will be afforded the same respect. Good playing tips can be gained from chalking games between competent players, from technique to finishing to improved mathematical proficiency. Take the opportunity to chalk for these guys even if you do not intent playing yourself, it will pay dividends. I hope that this feature ‘How to improve your game’ is of some value to each who read it, and if it has you know what I drink and where to find me.